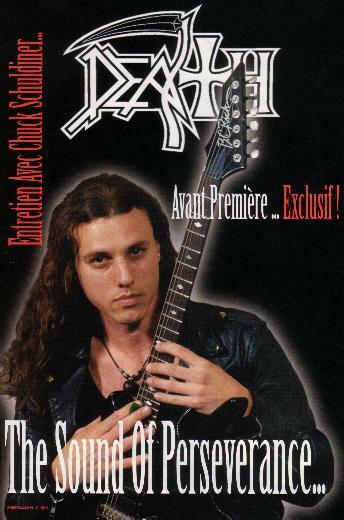 He is finally back… Chuck SCHULDINER is about to resurface with DEATH and a new album, “The Sound of Perseverance”. The man who generated more gossip than interviews will have people waiting for him around the corner… with a few ambushes from the media along the way! The ones who fed off his back in the past will again indulge to their hearts’ content. On our part, we will concentrate on enjoying Chuck’s music. Before going crazy over this last album, we sat down with the man during recordings… you know, the man who revolutionized the small world of extreme music by imposing his band’s name as a style of its own! How were you able to sign with Nuclear Blast and what happened with Roadrunner? First of all, Roadrunner had listened to our last album released with Relativity, and we signed a contract for one album, which was not a bad idea after all because I wasn’t satisfied with the way they managed Symbolic… After honoring the contract, I regrouped a few ideas I had for another project, Control denied, on which I am working now, before releasing the new Death album… When I started composing again for Death, I contacted a few record labels and some contacted me. One of them was Nuclear Blast, to whom I sent a cassette of 4 recordings we had made at my place… They loved it! I sent the same cassette to other labels, but for me, Nuclear Blast had a greater understanding of heavy metal. I appreciated the fact that they have a number of bands I like such as Primal Fear and Hammerfall. A lot of people were surprised that I didn’t choose a big commercial label, but I didn’t want to work with people who know nothing about metal. Is the new DEATH line-up once more a band to your image or is it a completely different formation? I still compose everything like in the past, but at the same time, we form a band in the sense that everyone can fully exploit its talent. I don’t see why you would have good musicians if they can’t show their skills. Working with good musicians is a must if I want to feel free to write what I want without following any trends. I want to abolish trends. I’m tired of America and it pisses me off!! This country is so hungry for trends that it has become sickening. In America, when you are original, you get laminated by trends, but here (in Europe) there are tons of fans that are addicted to pure metal, and this is exactly what the new DEATH album proposes! We can’t wait to go to Europe and around the world, but America is still the country who needs the most help. I really hope this album will be a turning point in the American metal scene because most bands only follow trends. I am not accusing anyone in particular, but a lot of big American bands have forgotten the roots of metal. Without being too nostalgic, we see DEATH is a mythical band in the metal scene. Since you are the forefather of a style, many have positive or negative thoughts and expectations on the upcoming album. What does this new challenge mean to you? In your view, is this new album a continuum of Symbolic or is it a comeback to ‘Human’? You took the advantage to exploit new musical aspects? Yes indeed, there are a lot of things on this album that I hadn’t tried before. But don’t worry, there is nothing eccentric or silly, I don’t mean to scare people. In a sense, this album gives a lot of freedom to the guitars and the melodies. Since Human, the metal scene has evolved a lot, where do you see yourself now? I hate categories, there are too many. I think DEATH is a metal band and that’s the end of it! People always try to categorize us but I keep saying we are a heavy metal band. When our demos were released, people started saying we played death metal. Back in the day, I thought the name was cool, but with time I started disliking the negative aspect of the term because I talk of more positive subjects. Today I’m 31 years old and I have progressed a lot musically, and what we do today is a lot more metal than before. I refuse to be categorized, and so I am always evolving, textually and musically, but in any case, DEATH is and will remain unique. Can you give a few details on this new album recorded at Morrisound? The title of the album is “The Sound of Perseverance”, and of course, the subject is perseverance, commitment and passion. The new band members and simply incredible and I’m very proud of this line-up. Everyone is devoted to heavy metal, an essential quality to be member of this band. One song is called “Flesh and the Power it Holds” and lasts over 8 minutes and “A Moment of Clarity” that lasts about 15 minutes. I think a lot of people will be pleased with this album. There will also be shorter tracks that will still last around 5 minutes! A ridiculous question… who wrote this album? Well… I wrote all the lyrics, and the music! This is all very natural for me, but I don’t control the band like many people say I do. For me, composing is like breathing. It is something I need to do. Everything I write linked to my everyday life, and people can relate to it. Did you ever think of changing the band name for your come-back? Yes, and it would have been something very easy for me to do. I have been away from the scene for a while and it wouldn’t have been difficult to say “Hey, I’m back with a new band”. But the fact is that I chose the name DEATH when I was 16 and it has since become famous. It would have been stupid to change it. People need to have something to relate to. I would have been sad to get rid of this name. And also, I don’t want to disappoint anyone of my fans. During your period of silence, what has marked you the most in the metal scene? A lot of CDs I bought have disappointed me. I didn’t buy the new Metallica because what they have done lately disgusts me, and I say that as a fan. They have said that they are not a metal band anymore and that they don’t care about the scene. I take this as a personal insult, as any metal fan would, but anyway, music is something personal, whatever the style. You appeared on Dynamo Open Air for your come-back. Are there any concerts planned in France and in Europe in the coming months? No, we will not come to France this time, and I regret it because I like France very much. But we will be playing across Europe. Last question, you were talking about a side project… Does it have a place in your schedule?